32 "This Jesus God raised up again, to which we are all witnesses. 33 "Therefore having been exalted to the right hand of God, and having received from the Father the promise of the Holy Spirit, He has poured forth this which you both see and hear. 34 "For it was not David who ascended into heaven, but he himself says: “THE LORD SAID TO MY LORD, "SIT AT MY RIGHT HAND, 35 UNTIL I MAKE YOUR ENEMIES A FOOTSTOOL FOR YOUR FEET." 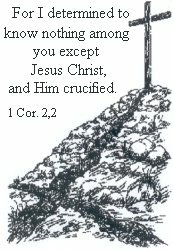 36 "Therefore let all the house of Israel know for certain that God has made Him both Lord and Christ--this Jesus whom you crucified. Who is this one who has been given all power? – Who is exalted by God’s right hand, and by that appears as one of the persons in the Trinity? We are talking about Jesus, one would say. And it is, - But not just anybody Jesus, who is being preached. It is like that in a lot of congregations unfortunately, that only the name of Jesus is mentioned, and then all is good. It is so few who actually know what they should listen to – so few who are capable to try out what are being preached. Therefore can seductive people come in and lead them almost wherever they want. But “My sheep know My voice,” Jesus says. And this voice is an appointed message. At Matthew’s Jesus says Himself something about the teaching about His name, - Which should make us really timid: “Not everyone who says to Me, 'Lord, Lord,' will enter the kingdom of heaven, but he who does the will of My Father who is in heaven will enter. “Many will say to Me on that day, 'Lord, Lord, did we not prophesy in Your name, and in Your name cast out demons, and in Your name perform many miracles? "And then I will declare to them, 'I never knew you; DEPART FROM ME, YOU WHO PRACTICE LAWLESSNESS.” (Matt. 7:21-23). “But he who does the will of My Father,” He will enter the kingdom of heaven. These people had prophesied, cast out demons, and performed many miracles, everything in His name, - But they had not done the will of His heavenly Father – because they could not enter, but was told to depart from Him. What kind of will did they not do? “For this is the will of My Father, that everyone who beholds the Son and believes in Him will have eternal life, and I Myself will raise him up on the last day.” (John 6:40). These people get access: Those who believe in His name! It is the Fathers will that you should believe in Jesus. Where the Father’s will is done, the soul will be destined for heaven, - yes, the heavenly door is then open for you. But those people that we read about – those who were told to depart from Him – they were actually able to do great things in His name, without believing in Him! They were convinced themselves that they believed in Him – and the signs that followed them were for them, “the evidence of faith. ”But the end of this faith in Jesus was perdition. What is this belief, where the Father’s will is revealed? First: You have probably heard the expression: “God has more to give!” Many people lives in this struggle after “something more,” – yes, their whole “Christian life” is about seeking and being active to get something more. By that they say pretty clearly that what they have achieved is very imperfect and insufficient, since they are left with unrest and an urge after something more. But is it not Jesus that they have received? – Him in whom all the fullness of God has a home. (Col. 1:19). What more is there, than all the fullness of God? You have been given everything, the Lord says to those who have taken their refuge in Him. That is what you should grow in knowledge of, and by the knowledge of God’s love revealed that He gave Christ in our place, also become filled with all the fullness of God (Eph. 3.1) – And not go after something else – like those who has made the Holy Ghost to a false god. We can see that because they have placed the Holy Ghost in a role He does not have according to the Word - nor want to have. Thereby it is not the Holy Ghost you meet in this preaching, but a false god - just like the Jesus you met in the previous mentioned lost preachers teachings, which not was the true Jesus, and therefore also a false god. These people preach that, - yes, you have received Jesus, but now you also have to receive the Holy Ghost in a special way, - while the truth is that no one can believe or receive Jesus without the Holy Ghost. When it says in the passage that Him (Jesus) has outpoured this – the Holy Ghost, - then He is outpoured, or sent to the world, - not to be anything for a person in Himself, - which means, that His works is not to be attentive towards Himself, - but has the work of making the word about Jesus alive for the heart, to bring us into believing in Him. He is also the one who will help the believer to grow in mercy and knowledge to Jesus. So, as we mentioned to show you that you already have been given everything in Him. “He will glorify Me,” Jesus says, and you shall notice that Jesus do not say, through a bunch of mystical manifestations, signs and wonders, - but: “…He will glorify Me, for He will take of Mine and will disclose it to you.” (John 16:14). He shall use the Word on us and remind us of what Jesus has taught us. “My soul is like a weaned child within me.” David says (Ps. 131:2), while these strive after more, and flutter like restless butterflies from one “flower” to another. What do you lack you who have received Jesus? Notice the serious word: “Depart from Me, you who have done injustice!” They nullified the indescribable gift of God (Gal. 2,21). What you seek after and yearn for has to be something that you necessarily do not have. For if you had it, - then you would not search any more. Now I have found what I ponder my blessed anchor – that is why one can travel about and preach - and also tell you about it! - The ground is Jesus death and wounds. It was clarified before the foundation of the world (Eph. 1,4). That is the foundation that will stand forever, when earth and heaven will perish. Did you hear what was preached to you now? Your sins – everything that shuts you out from the kingdom of God – Was put on Him, before the foundation of the world was made! What is this faith, by what we do the will of the Father? – Who is this Jesus we believe for salvation? Peter says so clearly in our passage: "Therefore let all the house of Israel know for certain that God has made Him both Lord and Christ--this Jesus whom you crucified." (v.36). When you read: the crucified – what do you exactly read? Yes, I can with joy and astonishment tell you what you read, you who have received faith in Him – and you who have not received faith, you read the exact same thing, but your eyes have not been opened to what is says, still: It says: “He who died for the atonement for all my sin!” He is Lord! It is no wonder the Word says: “Shout joyfully, you lower parts of the earth!” (Is.44:23). Have you not heard that He who atoned all your sin, - He has become the Lord of the kingdom of heaven! Incredible Gospel! “This Jesus God raised up again!” (v.32). This Jesus! – In other words, the one you crucified. Wherever you read and hear about Him, - you read and hear about your salvation – what God the Father have given you, because He wanted you with all of His heart – exactly you – into His heavenly kingdom! Wherever you do not read and hear about Him – there is only down fall and perdition, - how spiritual and devout it may look. “The Lord said to My Lord: Sit at My right hand” (v.36b). The writer in the book of Hebrews testifies of it like this: “When He had made purification of sins, He sat down at the right hand of the Majesty on high” (Heb. 1:3b). What is completed cannot be added to!